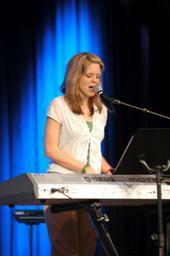 Jessie Goodman has been leading worship and writing music since she was a teenager. Now in her 30s and married, she and her husband, Ian, along with other band and ministry team members are working together to share Truth with a hungry generation! At home, (Lakeland, FL) Jessie directs "Sovereign Call," a discipleship program/ministry team for ages 14 and up. Ian is a musician, and teaches Drums/percussion and helps direct Jazz at Southeastern University.